We use a coding system for downwind sails which categorises sails by their purpose and wind range rather than by cloth weight. This has the advantage of being logical and transferable across a range of different boats. 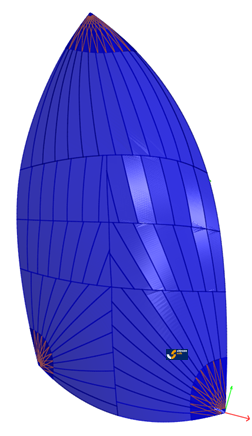 Even numbered sails are runners designed to sail at the deepest angles possible and odd numbered sails are designed for reaching. 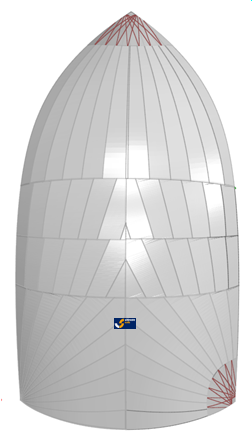 The higher the code number the higher the wind speed each sail is designed to operate. S stands for symmetric Spinnakers and A is for Asymmetrics. 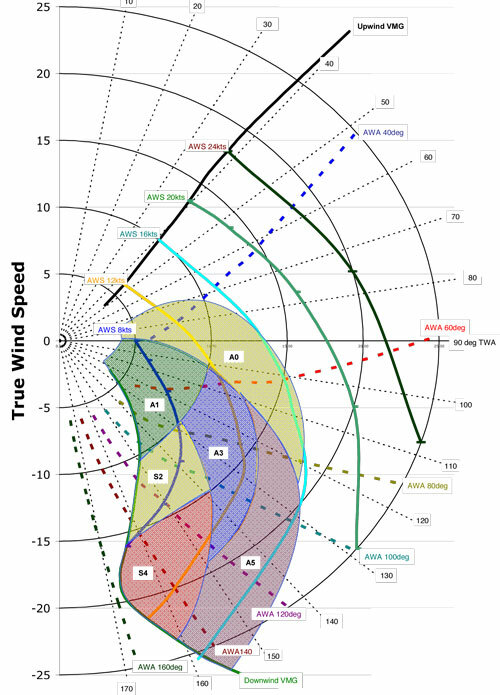 This chart shows the range of wind angles and speeds for a full inventory of Asymmetrics. When you are looking to maximise downwind performance in light winds an Ultimate Sails A1 or S1 is the perfect choice. 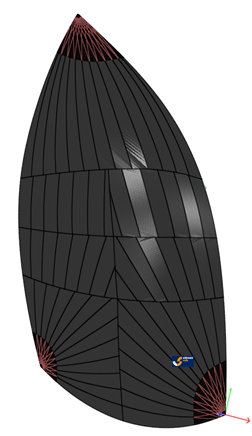 The design has been perfected through careful optimisation of the shape which has a very smooth camber profile across the sail. 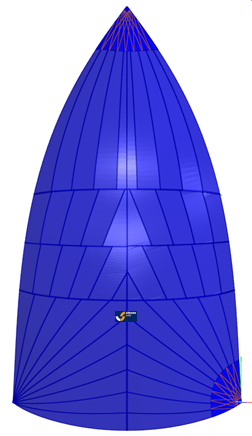 Further development of the luff shape and leech twist allow the sheet to be eased a long way opening the upper leech of the sail and helping acceleration which is especially fast in light and variable winds. The Ultimate Sails A2 or S2 is the workhorse of a downwind sail inventory and a must for light to medium winds when the angles sailed change dramatically with only a few knots increase in wind speed. It's a versatile design that is fast and easy to trim. The design has been perfected through careful optimisation of the shape which has a flatter profile in the head which makes the sail more stable in VMG conditions. If you want to maximise the downwind performance of your boat when reaching in medium winds then the Ultimate Sails A3 or S3 is the perfect choice. This sail is perfect for any kind of point to point racing or for VMG sailing in boats where the apparent wind is dragged forward. If you are looking to add more horsepower to your boat when sailing downwind in medium to strong conditions then the Ultimate Sails A4 or S4 is the perfect choice. The versatile design has won a reputation for being both fast and easy to trim and it's been refined over many seasons so that it excels when running at deep angles. The design has been perfected through careful optimisation of the cambers on the edges which give greater projection and stability when running. 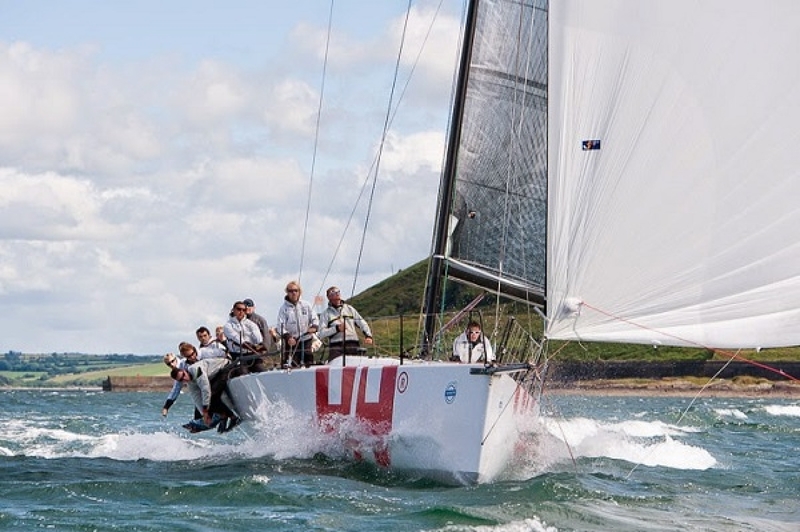 If you want to maximise the downwind performance of your boat when reaching or in strong winds then the Ultimate Sails A5 or S5 is the perfect choice. The versatile design has been refined over many seasons so that it is easy to trim in stronger winds.